The Doctor receives a distress call from the scariest place in the Universe: a child's bedroom, as the time-travelling drama continues. Every night George lies awake, terrorised by every fear you can possibly imagine – fears that live in his bedroom cupboard. His parents are getting desperate – George needs a doctor. Fortunately for George, his desperate pleas for help break through the barriers of all time and space and the Doctor makes a house call. But allaying his fears won't be easy; because George's monsters are real. 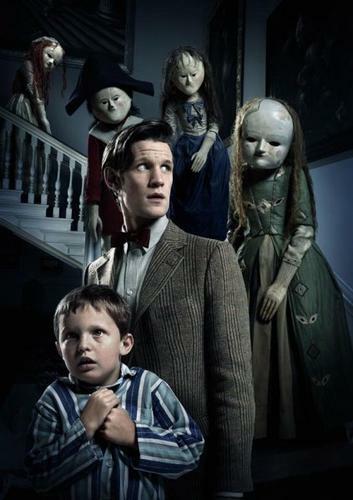 The Doctor is played by Matt Smith, George by Jamie Oram, Amy by Karen Gillan and Rory by Arthur Darvill. Obviously haven't seen it yet, but my kids are promising they won't be too scared to go to bed. Anyone currently watching with suggestions? He can handle the silents and weeping angles but this sent him over the edge?! Off the top of my head they were saying things like 'come back' and 'it's time (or I want) to play', but I'd have to watch it again to get the rest of that sentence, sorry. Great episode imo, creepy as hell for the kids, I can sympathise with you Nuggen, must have been a bad night for him lol. Loved the cgi of them turning into dolls, for the budget they have they out did themselves in this episode. Who was the director, anyone know? Whoever it was did a fantastic job as there were some gorgeous, and inventive, shots throughout. I think my only gripes were that the landlord plot didn't really go anywhere, but I doubt that mattered to the target audience. He was there to scare and be turned into a doll more than wanting his rent to be paid. Also the ending seemed too rushed, having another 5 mins added to the story would have been perfect. As it was the alien cockoo idea was pretty much missed first time round for me.